Autonomous vehicles will generate huge quantities of data. Where will it be kept? Adding safety features into cars and making them increasingly autonomous are rapidly creating a big data problem. More sensors produce more data, which has to be processed, moved, and ultimately stored somewhere in those vehicles. Exactly how that will be achieved isn’t quite clear yet. However, there is plenty of discussion on that topic—and for good reason. A new 2017 car will generate about 20GB of data every day, assuming the car has 2 cameras, 16 sensors and is driven 1 to 2 hours a day, said Claudio M. Camacho, head of marketing for Tuxera. Wally Rhines, chairman and CEO of Mentor Graphics, believes that autonomous vehicles ultimately will require a hybrid approach of distributed and centralized memory and storage. But the move toward Advanced Driver Assistance Systems (ADAS) is something of a game changer for data storage. For one thing, it will depend on much higher-performance processing, and that in turn requires a whole different set of memory architectures. There are number of factors impacted by ADAS. First, a lot more functionality is being added to those SoCs, which are now going into much more high-end performance requirements. Until now, processors in cars might have included a 300MHz embedded microcontroller. ADAS processors use multiple 64-bit multi-core processors from ARM and others, some developed using the latest finFET processes. These devices have the same kinds of storage needs you would expect to find in other high-speed computers, including LP-DDR4 running at speeds of up to 3,200 Mbps, which is considered the sweet spot for a lot of newer ADAS processors. All of that means more data to process and store. In addition to the DRAM increases that will be required, because of new ADAS applications along with traditional infotainment, there is further use of NAND flash for storage. 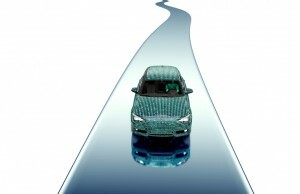 This would be in support of mobile storage standards like embedded multimedia card (e.MMC), and maybe moving to universal flash storage (UFS) or solid state drives to address the requirement for storage to continuously update real time maps when all the automakers start rolling out their autonomous driving offerings. Hubert Bailey, director of storage solutions applications engineering at Marvell, pointed to other areas where storage has been used within cars, such as GPS systems, entertainment systems, web access, and logging. GPS systems use storage to store the map set for the car, and then rely on the GPS antenna to determine the location of the car on the maps, while entertainment systems have used storage for storing movies and audio to be played in the car. In some cases, the movies use a DVD player connected to the entertainment system, and audio systems have been savings CDs or downloaded MP3 files to internal storage for playback. Further, as web access increases in the car, the need for caching goes up. This is another place where storage can have some impact. But when it comes to architecting the system to place the memory and storage in the optimum location, it will depend on the system where the storage is located. Most entertainment and GPS systems currently do not have a built-in storage port, and Marvell devices have been used to augment the system to add SATA storage ports. As far as whether the memory and storage will be shared, Bailey explained that different systems typically have operated independently. But as the level of integration goes up, the storage may become shared. Another option would be distributed memory and storage, which Bailey sees as an area in question, and Tiered suppliers are awaiting direction for the automotive OEMs. In keeping with the integration trend in the general semiconductor space, the automotive industry is following suit and starting to integrate some of those separate ADAS ECUs. “This is because the SoCs are able to integrate those applications into centralized ADAS processors as opposed to one ADAS ECU with its own ADAS processor per application, there’s no reason why you can’t architect so there are multiple applications in one ADAS processor,” DiGiuseppe added. This will also increase the memory requirements depending on the applications that are combined into one processor. No one is quite sure how much data ultimately will need to be stored in a car, for how long, or in what form. Initial concepts for autonomous vehicles involved much more processing in the cloud, and target dates for introducing autonomous vehicles into the market as of just several years ago were in the 2030 timeframe. Now Ford has announced it will have autonomous vehicles on the road within the next four years, and Tesla already has a self-driving mode working inside its cars. That has stepped up requirements for storage and advanced processing architectures, and many of those architectures are works in progress. But there is no question that they all rely on moving, processing and storing much more data than in the past, probably including at least some RAW image and video data. Some will need to be recalled quickly from memory, some will need to be stored for different periods of time using some type of storage. And nearly all of it will have to be architected into the system and managed in a way that can be utilized by a fast-moving safety-critical system. These are difficult parameters for designers, made even tougher by extreme conditions that can affect reliability and unknowns that seem to change dramatically by the car model year. Each new node and architectural change results in an explosion of data, making optimization of designs significantly harder.